There's a new tradition in the wedding world. I saw a photo of it on someone's fan page of Facebook...and had to examine it further. For those who have no idea what this "ancient" form of communication record is. Please see the typewriter Wikipedia page here. Back to topic. Weddings have been around for centuries and everywhere you turn these days, couples are trying to find alternatives in longstanding traditions that are both unique - but awesome. My new favorite trend is using a typewriter as a guest book. So how are you supposed to do this? Let's go over the steps. 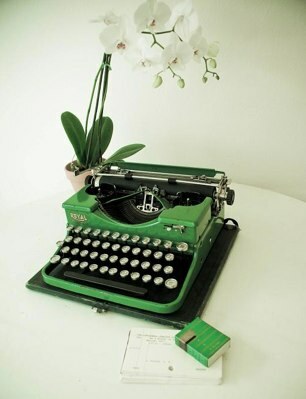 Purchase a working vintage typewriter. You don't have to spend a lot of money. My first thought would be to search around on Craig's List. Over the last few months I've become quite amazed as to what you find and sell on there. 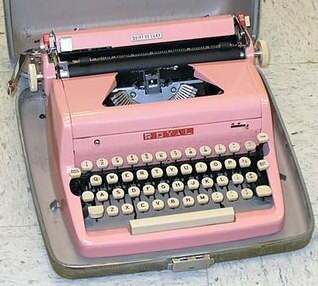 Next place to check would be eBay or local vintage and antique shops. Next you'll need to pick out the type of paper you would like for your guests to sign. You have two options. The first being one long consecutive message in which for all guests to sign. 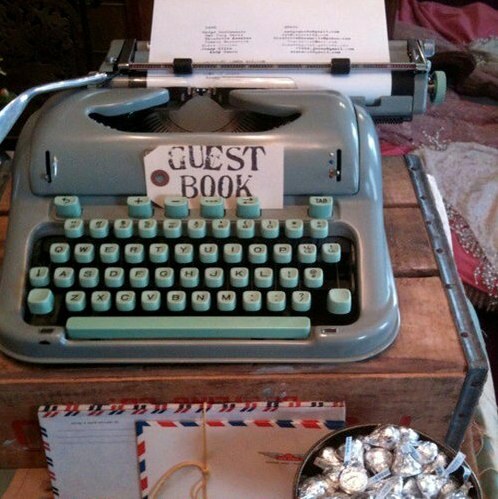 The second being that each guest (or couple) signs their own message to a single piece of paper. Once you decide, you can leave the instructions on the table where the set up shall be. At the reception venue, you'll need to place all the items on a front table. 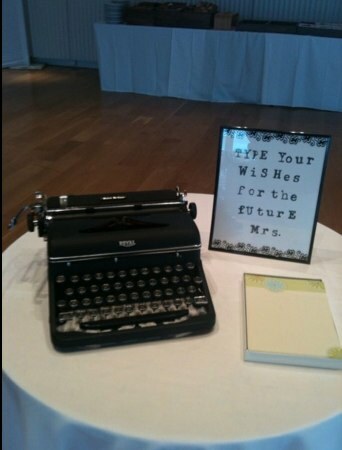 You can leave a fun sign with something like "leave some well wishes for the new Mr. & Mrs." -- Also, it would add to the flare of it to add different decor that go with your overall theme for your wedding! Like I said, online web sites like Craig's List are your best option for both price and variety of style of the typewriter (or hey, anything else you are looking for, for your wedding). So why is this trend popping up? 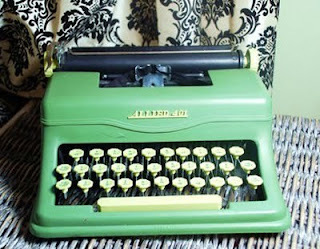 Vintage and saving money - these days - have been going hand-in-hand. 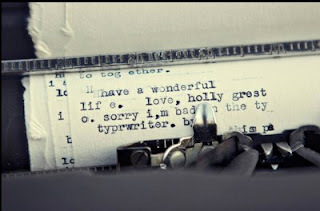 While understandably so, you could probably find an expensive typewriter...but more than likely it won't cost more than $50....and even that is a price that's negotiable. One small thought though -- before you go buying, making sure to ask your older relatives if they have any-- would be nice to add their property to your wedding class. 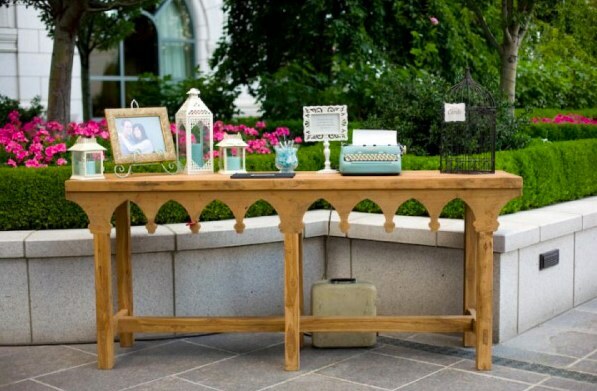 Not only is this a simple set-up...the keepsake you will have is quite the household item. 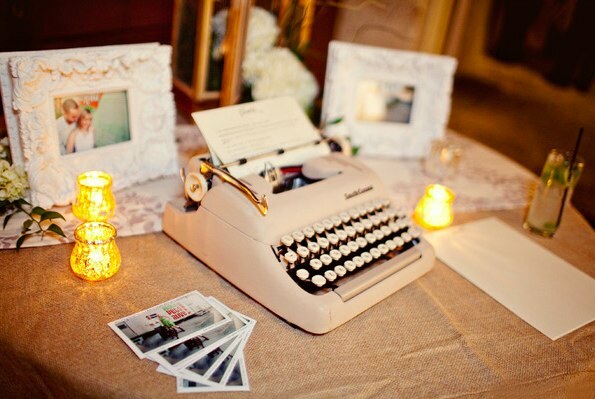 Post-wedding you can have all the pages bound together BUT you can put the typewriter some place in your residence as both a reminder of your wedding day and a fabulous vintage decoration.